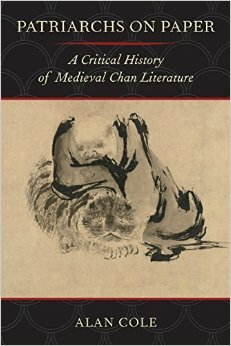 Alan Cole’s Patriarchs on Paper: A Critical History of Medieval Chan Literature draws together some recent scholarly research on Chan Buddhism’s core texts, e.g., its various Tang and Song Dynasty genealogies, transmission of the lamp compendia, and koan collections, as well as the Platform Sutra, and the monastic rules for purity (Chanyuan Qinggui) and presents them in the form of an historical overview for the interested general reader. Cole is described an independent scholar who has taught at Lewis and Clark College, Harvard University, the University of Illinois, the University of Oregon, and the National University of Singapore. Cole views these core Chan texts as products of historical, cultural, and literary evolution, charting the changes in their content and style over the course of centuries, and speculating on the various purposes these texts might have served. His basic orientation can only be described as “ironic,” that is, that the texts cannot be taken at face value in that: 1) they represent a literary tradition rather than a practice tradition, 2) they express in letters and words what is allegedly beyond letters and words, 3) they describe a process of dharma transmission that fictionalizes and romanticizes the actual process of transmission, 4) they reflect steadily increasing Taoist and antinomian trends in Chinese Buddhism that were at variance with both normative Buddhism and actual Chan monastic practice 5), they employed increasingly stylized rhetorical strategies that fictionalized the accounts of Chan ancestors in increasingly entertaining ways, and 6) they reflected, among other things, the exigencies of various patriarchs as they strove to secure their authority and win favors from the imperial court. Most interesting to me was the examination of the written “historical” record in terms of what is “known” about Zen patriarchs such as Bodhidharma, Huike, and Huineng. The stories about them change and are embellished with each passing generation. The pithy, witty, and archetypically Zen sayings attributed to them only begin to circulate centuries after they are long gone—if, that is, they ever existed as more than literary protagonists at all. During the Tang Dynasty the sayings attributed to the Chan patriarchs are mostly stock paraphrases of sutra passages. Only after a time do the fly whisks, unconventional behavior, and rhetoric of negation emerge, only fully making their appearance during the Song Dynasty. As such, these epigrammatic sayings are fictional inventions placed in the ancestors’ mouths rather than the authentic accounts of the sayings and doings of real Tang Dynasty masters. Over time, the Chan patriarchs begin to look more and more like the protagonists from another, older Chinese literary tradition: the Taoist sages. When koan collections such as Wumen’s 13th century Gaterless Barrier begin to appear, they include witty, ironic commentary and well-crafted poems that let you know that the authors are not simple Taoist sages, however, but accomplished Song Dynasty literati who are self-consciously introducing a new literary form written—not for the benefit of simple monks—but for consumption by other Chinese literati. The text suffers from the limitations of the author’s arch and ironic stance and his tendency to speculate beyond the data. He never considers the possibility that these texts might—despite their constructed literary nature—be vehicles for important religious insights or facilitate genuine spiritual attainment. The book also shares the limitations of any summary of detailed research for general readers in that one often finds oneself wanting more extensive and detailed examination of quotations from the texts than those that are offered. Despite these limitations, this book fills a genuine void. Zen practitioners who are unable to keep up with scholarly books and articles—that means almost all Zen practitioners—will find it an invaluable addition to their library. It will give them a much more complex and nuanced understanding of the tradition they have inherited, in much the same way that scholarly Biblical criticism since the 19th Century has transformed our understanding of the Judeo-Christian tradition. The bad news is you’re falling through the air, nothing to hang onto, no parachute. The good news is there’s no ground.